We sell indigo produced in El Salvador, which is the main indigo producer in Latin America. These indigo plants are grown on small farms that are committed to organic and fair trade production. The farms are reviving indigo cultivation that has been a traditional crop in that area since the 1800s. You can help small-scale Salvadorian farmers by using our high quality indigo to dye beautiful blues. 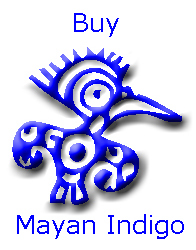 Mayan indigo has a high indigotin content (45%) making it easier for you to achieve dark blues. 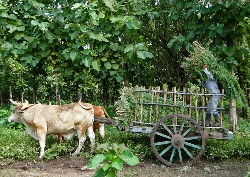 Indigo grows well in the seasonally dry volcanic soil of El Salvador. Like all legumes (the bean family), indigo has nitrogen-fixing bacteria in the roots enhancing the soil fertility, so there is no need for chemical fertilizers on the indigo crop. The species grown is Indigofera tinctoria. In El Salvador, all harvesting is done by hand, employing local workers, and the leaves are transported to the processing tanks by oxcart, a traditional, low-environmental impact system. The leaves and branches of the indigo plants are piled into a concrete tank with fresh well water. Workers then tread barefoot on the leaves to macerate them and the leaves are left to rest and ferment for 12 hours. When the water has been drained, the residue is greenish blue. For more information on the chemistry behind this process see indigo chemistry. A pump is used to agitate the water in the indigo vat and introduce air until blue foam appears on the top and the indigo pigment starts to form. 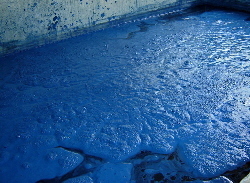 The blue water in the vat is then left to rest for a day. The indigo pigment slowly settles to the bottom of the tank. Most of the water is siphoned out and the wet pigment is then placed on cotton cloth to filter out the remaining water. The indigo paste is spread out onto tins and dried in the sun until it solidifies and shrinks, creating a beautiful crackle pattern. No fossil fuels are used to dry the indigo. 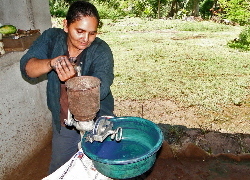 Finally, the pigment is ground by hand into the fine Mayan Indigo powder that you buy from Wild Colours.